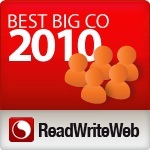 ReadWriteWeb first honored Facebook with Best BigCo in 2007, due to the launch that year of its development platform. Over 2010, Facebook has gone to a whole other level. It experienced astounding user growth and shut out all competition as an all-purpose social network. For this reason, Facebook is ReadWriteWeb’s Best BigCo of 2010. ReadWriteWeb started this tradition in 2004, making this the 7th year. In 2009 it was Google, thanks to Chrome, Android and other advancements. In 2008 Apple, due largely to the iPhone and App Store. Facebook won in 2007, Google in 2006, Yahoo! in 2005, and Google got the inaugural honor in 2004. Last year, when ReadWriteWeb looked at the top real-time Web products of 2009, they predicted that in 2010 the real-time Web was “likely to become a standard expectation on sites all around the world”. Indeed, as we look back on the last year we find that many of the big innovations in terms of the real-time Web come in the form of implementations by companies like Google and Facebook. At the same time, there are still smaller players in the realm that have changed how (and how fast) we expect information on the Web to move and people interact. The rise of Facebook as a truly mainstream social network was a big story this year. An interesting question is, how much of Facebook’s success was directly related to its loosening of privacy controls at the end of 2009? That move created both a backlash and a huge bump in users as 2010 unfolded.